This octogenarian round is beginning its second century. Developed in 1895 for Winchester's Model 1892 lever gun, .25-20 Win ammo became a favorite of trappers, ranchers, sod-busters, and all those looking to just put grub on the table. 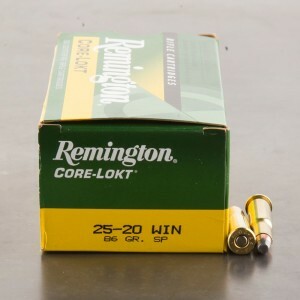 It was very popular until the advent of the more modern .22 calibers like the .22 Hornet or the .218 Bee. The little round can put lead on target or game between 1,500 and 2,000 feet per second with bullets ranging from 85 grain down to 60 grain. Although some say the round can be used to harvest white-tails - in fact, in 1914, Jim Jordan allegedly bagged the historic Jordan Buck in Wisconsin with it (today, that caliber is illegal for use on white-tails in Wisconsin) - it might just be a recipe for wounded game if so used. Before using modern ammunition in your older or antique .25-20, you should have a qualified gunsmith check the firearm carefully; older guns may not stand up to the pressures modern loadings produce. Hard to find... YES! it's expensive but rifles in this caliber have tremendous history behind them. https://community.deergear.com/legends/james-jordan-buck/ Pretty cool story that's probably "close" to accurate. I have a very old 25-20. The ammo I ordered from ammotogo came quickly and worked well. My friends also enjoyed shooting the rifle. Would recommend ammo to go for anything.